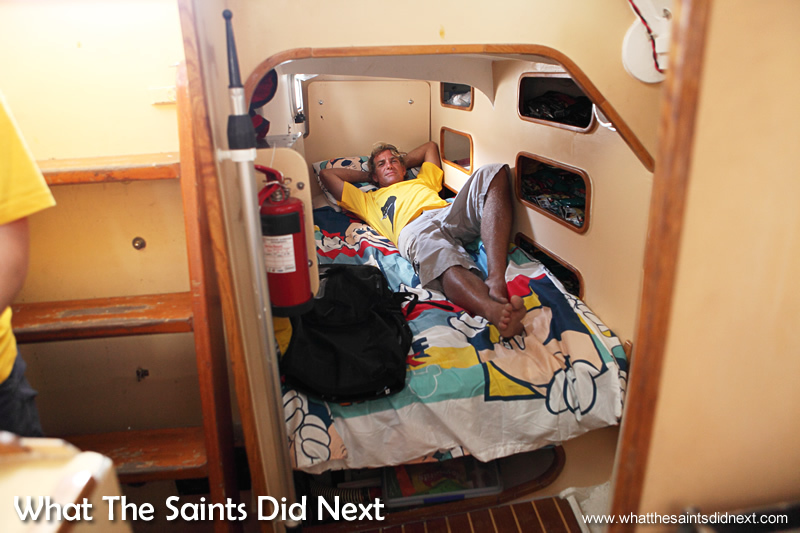 Visiting with the crew on Black Cat, anchored in James Bay, enjoying a rest after winning the St Helena Governor’s Cup Yacht Race. Back row L-R: Cathleen Hughes, me, Adrian Pearson, Shaun Cooper and Dave ‘Wavy’ Immelman. Front: Sophie Pages. It’s tradition to throw the skipper (fully clothed) into the water when you’ve won a sailing race. 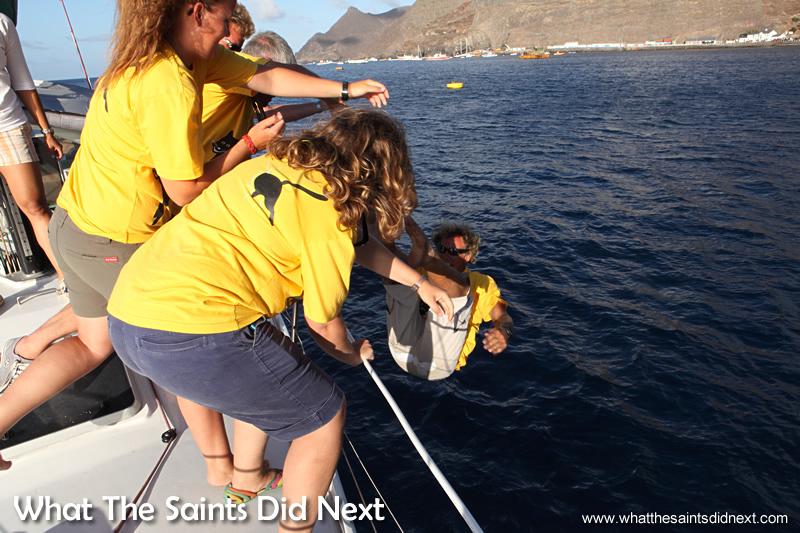 Having taken the flag in 12 days with the ocean crossing from Cape Town to St Helena winning the prestigious St Helena Governor’s Cup Yacht Race, the crew of Black Cat grabs a limb each and gleefully toss their captain overboard. Apart from this playful mutinous act, skipper Dave ‘Wavy’ Immelman of the 20 year old, 40ft cruiser and his hardy four ‘man’ crew, meant serious business right from the boom of the starter’s cannon, maintaining their racing mentality throughout the 1,700 mile challenge. The race, which takes place every two years, started from False Bay Yacht Club in Simon’s Town on 27 December 2014. The crew kept a tight boat, packed light, ate freeze dried ‘astronaut food’ and adhered to strict three hours on, three hours off shift patterns. 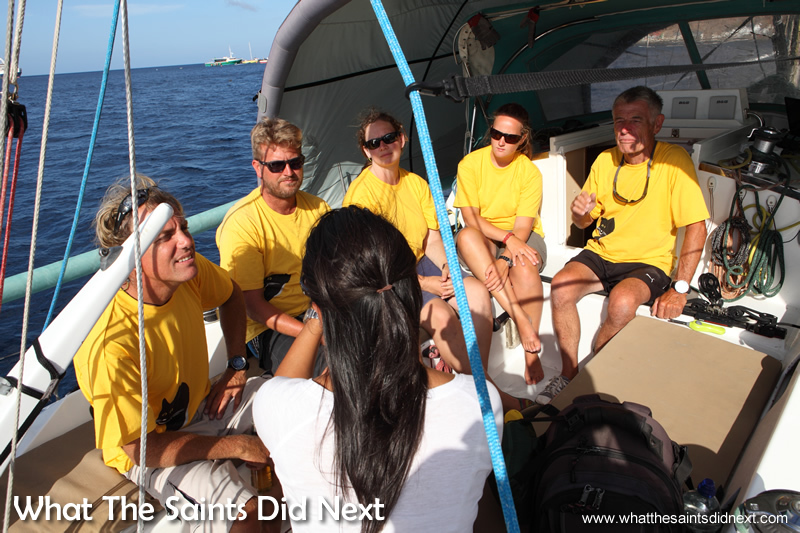 We are sitting on the cosy aft deck of Black Cat, moored in James Bay, chatting to the rested winners of the St Helena Governor’s Cup Yacht Race as the turquoise sea gently laps against the boat and a light breeze sweeps the harbour. In the warm glow of the afternoon sun the crew excitedly recount the trip. Skipper Dave Immelman being thrown overboard. It’s a tradition thing! 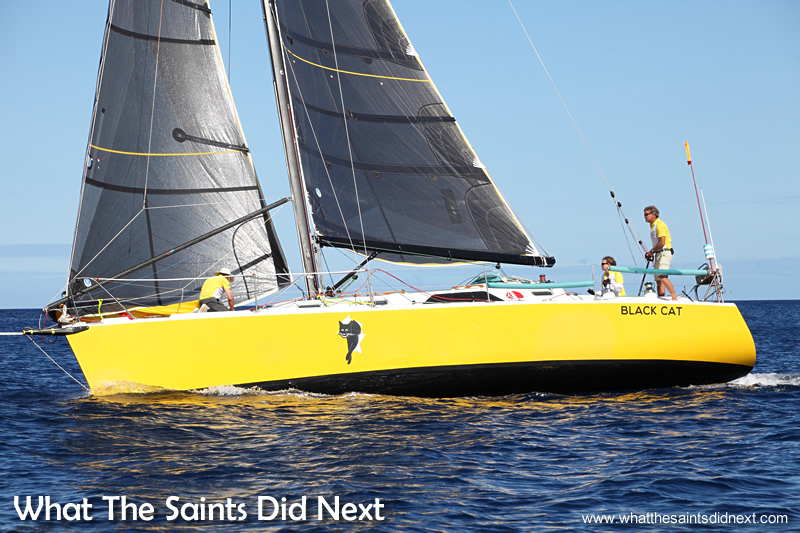 – St Helena Governor’s Cup Yacht Race winners, Black Cat. Yum, ‘astronaut’ food! Black Cat crew show off their race rations. Hearing all about the adventure. 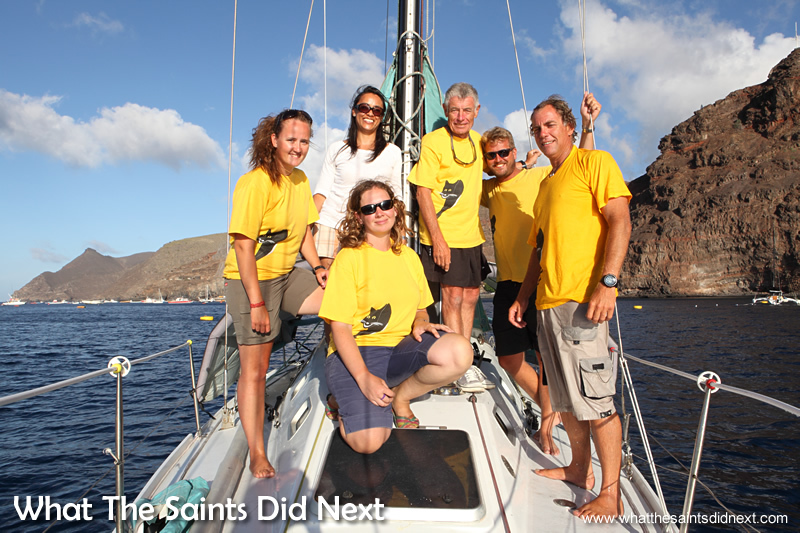 Interviewing the crew of Black Cat, winners of the St Helena Governor’s Cup Yacht Race. All 17 boats were placed in racing class until they use engine power which moves them into the cruising class category. The multi-hull yacht Banjo, also completed the race without motoring, breaking their own line honours record in nine days, 13 hours. But the actual Governor’s Cup goes to the mono-hull fleet. Nodding in agreement is First Mate, Cathleen Hughes and crew members, Shaun Cooper and Sophie Pages. At just 19, Cathleen has 9 years experience under her belt. 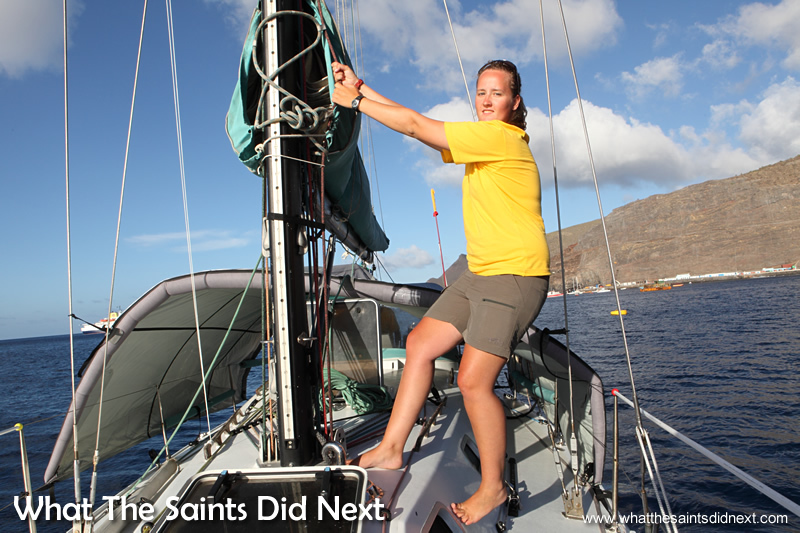 “I learnt to sail with the Scouts, started ocean sailing in 2012 and sailed to Rio in 2014,” she tells us. First Mate, Cathleen Hughes demonstrating how the sails are changed and configured on board yacht Black Cat. 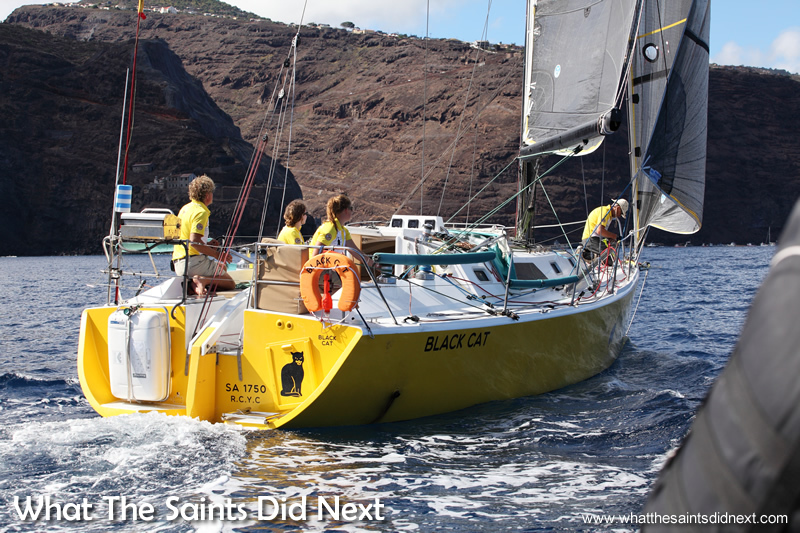 St Helena Governor’s Cup Yacht Race winners, Black Cat on the morning of 8 January 2015, arriving at St Helena. The St Helena Governor’s Cup Yacht Race victory is particularly sweet for three of the gang. For the last GCYR, in 2012/13, Black Cat with Adrian and Dave on board led the fleet, until diesel contaminated their fresh water supply, forcing a stopover at Luderitz, Namibia. This voyage wasn’t completely incident free. At the start an open front hatch and big waves meant the crew had to pump out a few hundred litres of sea water. Two days later they found the water tank had cracked. “So we got a bilge full of water again!” laughs Dave. Hooray for Black Cat’s desalination plant which makes 30 litres of fresh water in 10 hours, quickly restoring supplies. 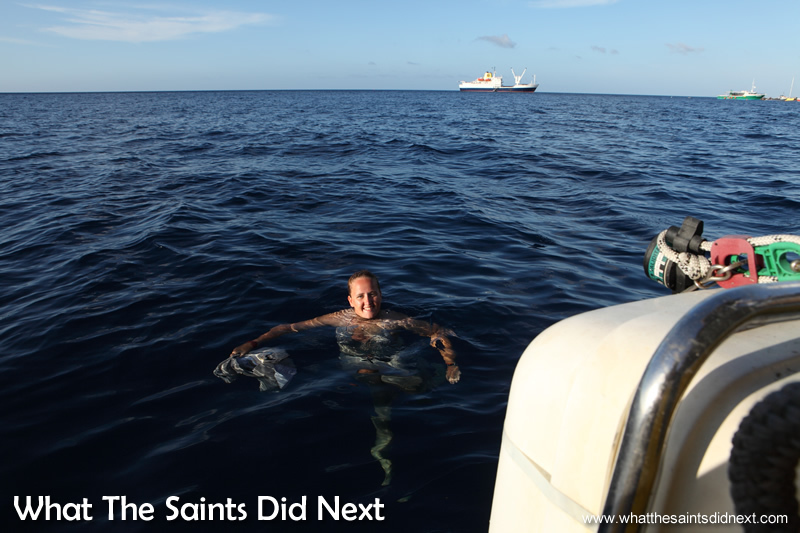 The water tank mishap did not affect bathing routines, as the crew wash with sea water. Tethered to the back of the boat, they’d lather up and rinse with pots of water. 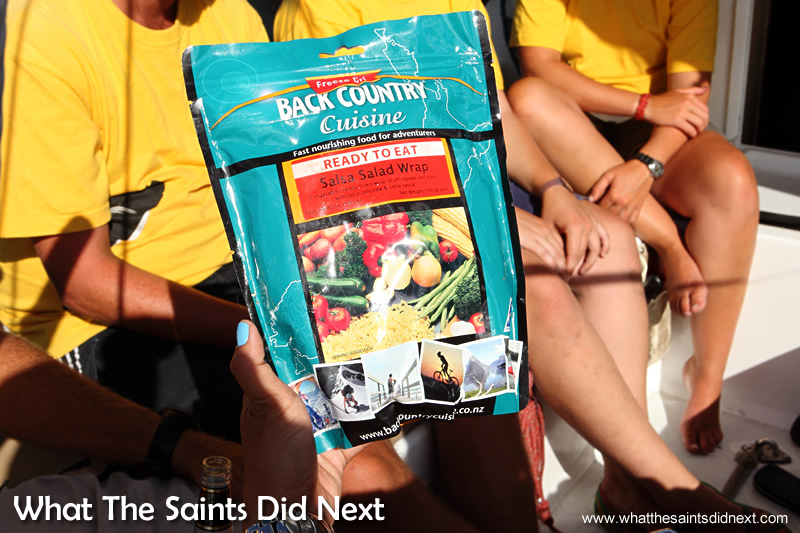 “You just add water, and leave for a while,” explains Shaun who unofficially became the onboard chef. Meals include salsa salad wraps that contains vegetable with chick peas and corn, and muesli and yoghurt for breakfast (Sophie’s favourite). 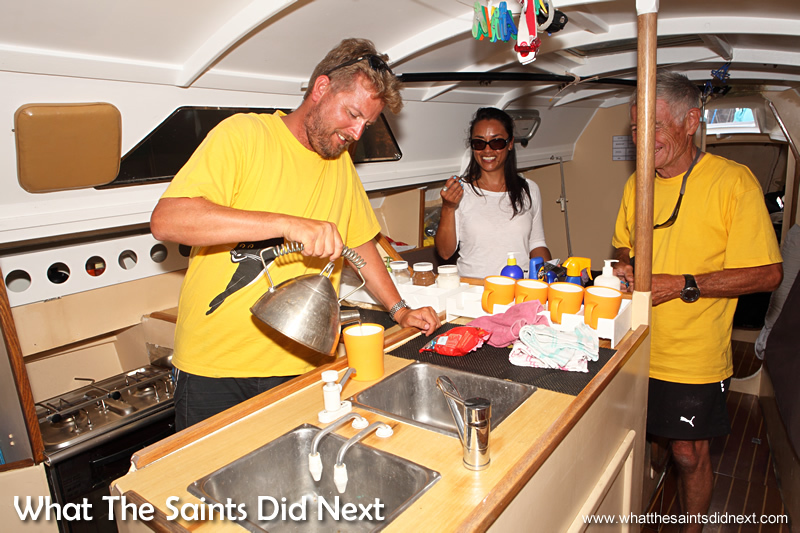 Shaun Cooper became the unofficial chef on the voyage – St Helena Governor’s Cup Yacht Race winners, Black Cat. Sophie Pages shows us how the ‘lee cloth’ stops her falling out of bed. 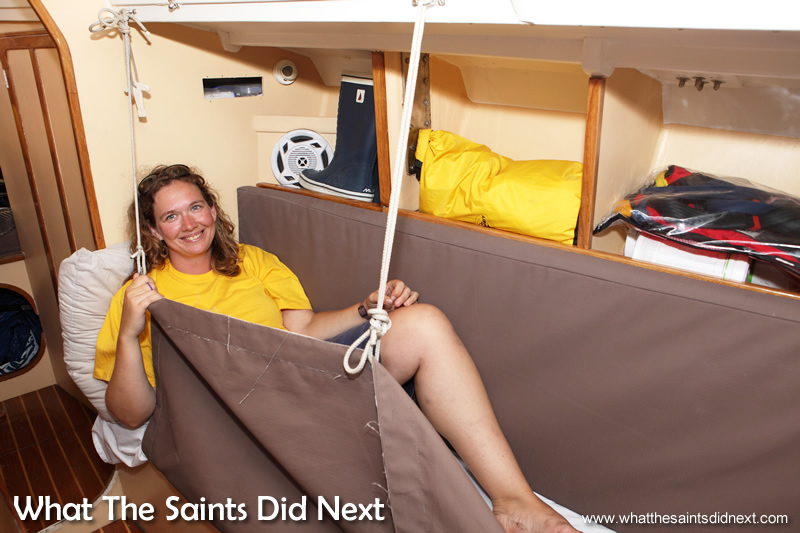 St Helena Governor’s Cup Yacht Race – It’s a Disney duvet for Skipper, Dave Immelman. 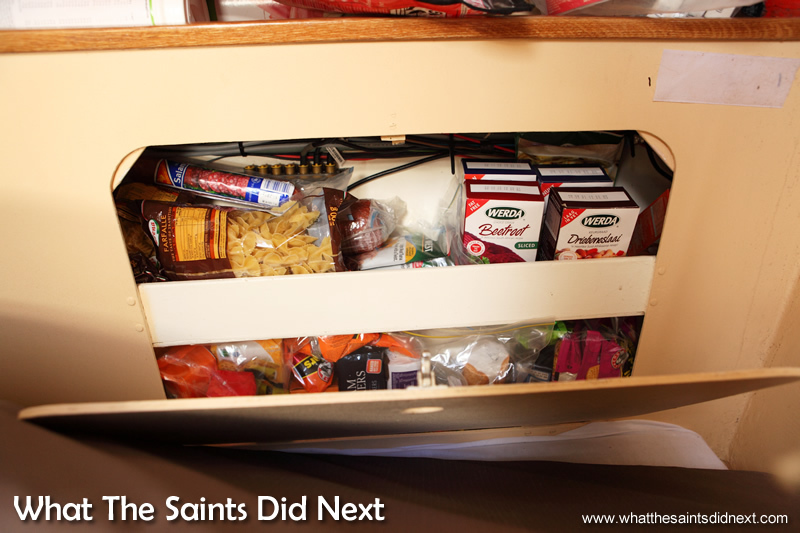 One of the cleverly concealed food lockers on board yacht Black Cat. Stashed away in one of the multiple cubby holes was a ‘snack pack’ brimming with chocolate and other goodies, called upon to boost morale during the trip. Recounting a story of ‘stolen’ Smarties in the night has the whole crew roaring with laughter. The give us the grand Black Cat tour; we climb down a short step ladder into the belly of the boat. About three metres at its widest point, this is the sleeping, cooking, dining, and office area. Every available space is efficiently used. A very compact toilet/shower cubicle is at the front. 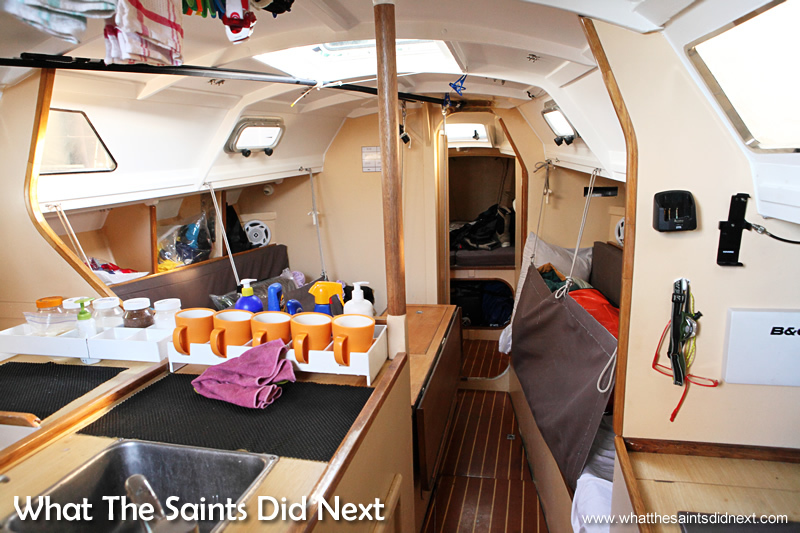 Inside the open space cabin of yacht Black Cat. 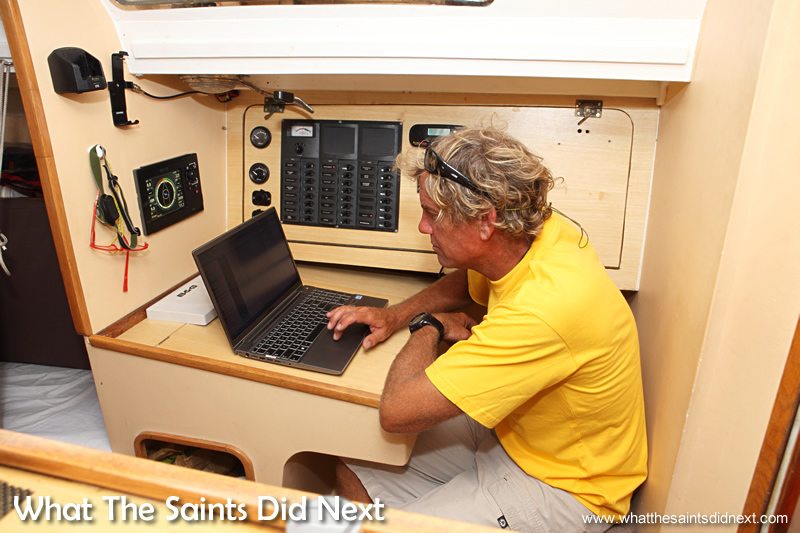 This is where skipper, Dave Immelman, downloads weather and race data for yacht Black Cat and checks navigation details – St Helena Governor’s Cup Yacht Race. 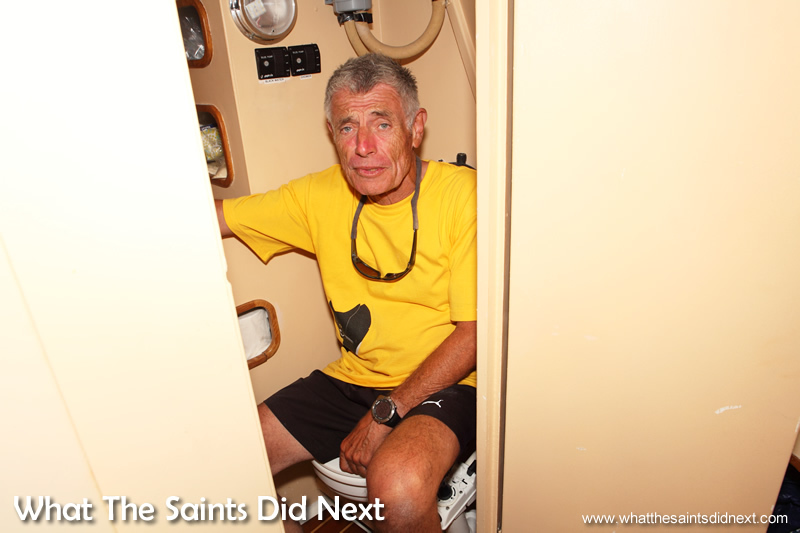 Adrian shows us the tiny toilet/shower cubicle on yacht Black Cat. The noisy bunk in the bow. 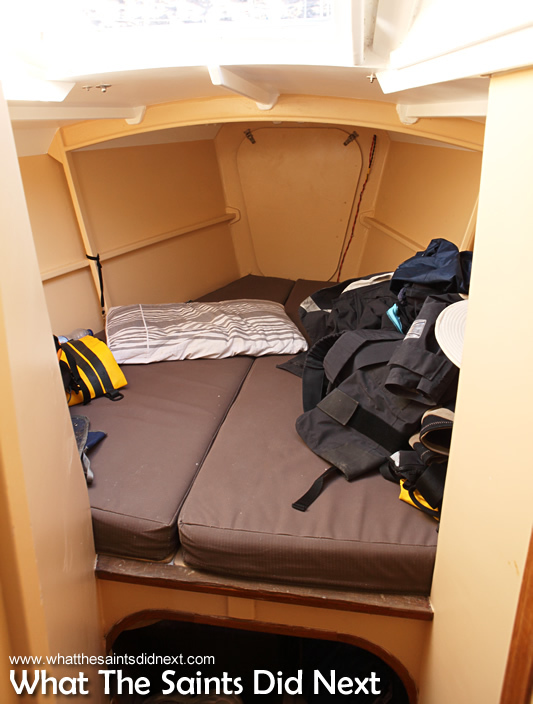 The Dudley Dix 38 yacht sleeps five people in confined spaces; two ‘double’ bunks are aft, two slim bunks in the middle require ‘lee cloth’ canvas barriers to prevent toppling out and there is a bunk in the bow which bears the brunt of movement and noise of oncoming waves. Not good if you are claustrophobic. Communications at sea is done via satellite phone and email. The team kept tabs on the competition via daily reports giving each yacht’s position. “The St Helena Governor’s Cup Yacht Race is a major blue water race, in world stakes it’s in the top 40,” Dave tells us. Black Cat crossed the finish line at 9.14am on 8 January and moored alongside yacht Avanti who had pipped them by 7 hours. “We got in, moored up and they starting clapping, ” says Sophie. The Avanti crew revealed they had motored for 95 miles, thus making them ineligible for the Governor’s Cup. 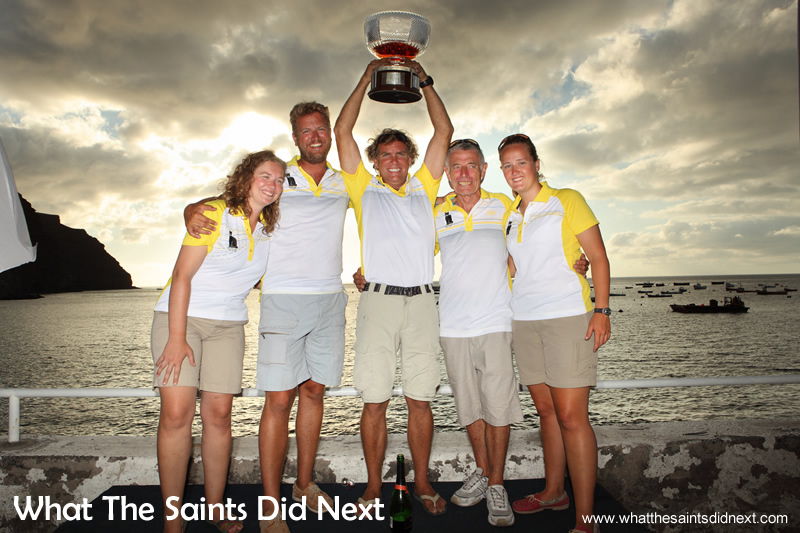 Black Cat crew, lifting the Governor’s Cup at the presentation ceremony – St Helena Governor’s Cup Yacht Race. Cathleen takes a swim to retrieve the patchy shorts. RMS St Helena in the background at anchor. The gang has been ashore and enjoyed some sightseeing and are now getting ready for a hog roast and night out at Ann’s Place. 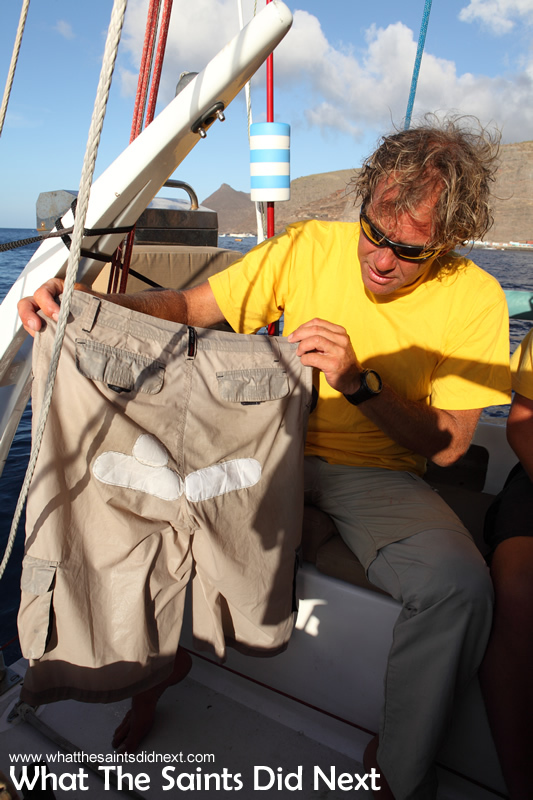 Whilst Dave is changing below deck, Adrian emerges to show us the skipper’s patchwork shorts and impishly tosses them overboard. As the dutiful first mate, Cathleen jumps in to rescue them. Black Cat approaching the finish line to win the St Helena Governor’s Cup Yacht Race. Great article and photos, thanks for the link to my design page. I wanted to be aboard for this race but it wasn’t to be. Maybe next time. I feel a need to visit St Helena because an ancestor of mine arrived in Cape Town from St Helelna and was the first Dix to settle in South Africa. I was with Sophie on Ray of Light on the last Governors Cup, and know how special this is for Sophie and Black Cat who limped into Luderitz behind us. Well done all of you. They were estactic about winning – especially Sophie. Perhaps ‘Ray of Light’ can try the next GCYR?! Having my beloved grand daughter as 1st mate has made me very interested in the race, I think that you are a wonderful crew, great winners, I salute each one of you Congratulations. Thank you so much. We really enjoyed reading your amazing article. It is almost as good as being with them again after not seeing them for over a month! Hi Cathleen’s mum! The Black Cat crew were lovely to meet and full of stories. We bet you now can’t wait to see that bright yellow hull appearing over the horizon. Once again Sharon, great pictures and an amazing story! Well Done to all crew on the Black Cat!! What an amazing story and pictures these guy’s told it as it was, The Governor;’s Yacht Cup Race is such a big deal for all those who sail or took part in anyway what a classic way to portray St Helena. Congratulations Sharon you have a sparkling talent. I never know what some Saints going to do next. Thanks for the feedback! The Black Cat team were pretty inspirational, lovely people to meet and it would have been hard to take a bad photo of them – good looking bunch!